This delicious muffin recipe is a perfect tea time serving for everyone. It's up to you how strong the rosemary flavor you want in the muffins. So, do not hesitate in adjusting its quantity as per your taste. They are done pretty quickly in the oven so you can make them fresh just before the gathering. Chop fresh rosemary as fine as you can to get the best results. 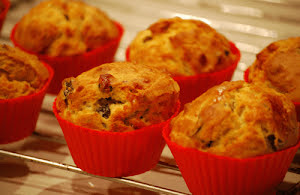 Use fresh or semi-dried black olives for infusing the best flavor within muffins. You can either use a combination of butter and cheese or can simply use the former option. I love to serve these muffins with a buttery dip or with sour cream. It's time to make these fluffy, light, and scrumptious muffins loaded with olives and fresh rosemary. Savor these delicious, light, and irresistible muffins flavored with black olives and with loads of fresh rosemary which gives it a unique aroma and taste. Sift flour, baking powder, garlic powder, and salt in a bowl. In a separate bowl add milk, butter, cheese, egg, olives, and rosemary. Whip and mix all the ingredients for about 2 minutes. Thereafter, transfer it to the bowl of sifted flour. Lightly mix everything for about half a minute. Grease the muffin tray and carefully spoon 3/4th of the muffin base in each cavity.